A new Android phone is set to come out from one of our local manufacturer Starmobile. 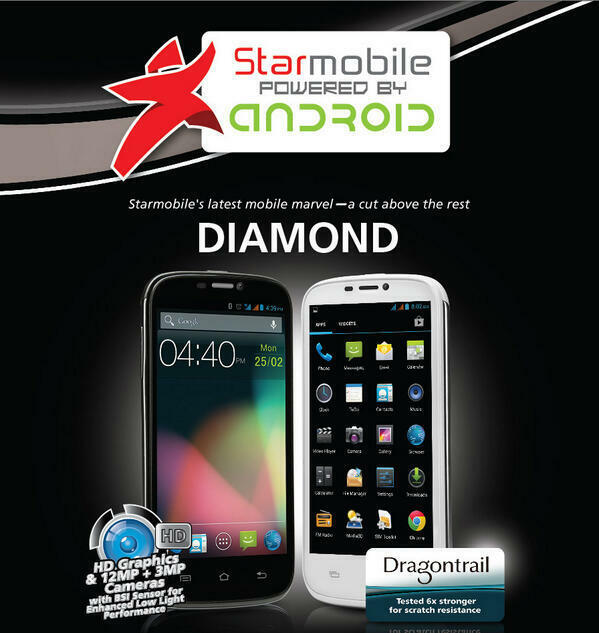 Lot of tweets about the latest phone Starmobile Diamond plus the image attached confirming the model name ‘Diamond’. Starmobile Diamond has a 12-megapixel rear camera with BSI Sensor for enhanced low light picture taking. As everyone is waiting for the official specs, price and release date of Starmobile Diamond, you can follow @happyman on Twitter to receive the latest updates of this new Android phone from Starmobile. Starmobile has not yet release the details of their new Starmobile Diamond but seeing on the image banner from their Twitter account Diamond is in HD in terms of graphics that is the same with Cherry Mobile Omega HD. Another thing in common on Starmobile Diamond and Cherry Mobile HD is the camera, both device has a 12 megapixel camera with BSI Sensor. Lastly, Diamond and Omega HD has both Dragontrail display protection. That’s all for now folks, will keep you posted once Starmobile officially announced the price, specs, availability and release date details on this. wow ang ganda ng camera... Anung Os ng andriod po ito? Kelan release nito..?